Andesite: The specimen shown is about two inches (five centimeters) across and has a porphyritic texture. Igneous rock composition chart: This chart shows that andesite is typically composed of plagioclase, amphiboles, and micas; sometimes with minor amounts of pyroxenes, quartz, or orthoclase. Andesite is the name used for a family of fine-grained, extrusive igneous rocks that are usually light to dark gray in color. They often weather to various shades of brown, and these specimens must be broken for proper examination. Andesite is rich in plagioclase feldspar minerals and may contain biotite, pyroxene, or amphibole. Andesite usually does not contain quartz or olivine. Andesite is typically found in lava flows produced by stratovolcanoes. Because these lavas cooled rapidly at the surface, they are generally composed of small crystals. The mineral grains are usually so small that they cannot be seen without the use of a magnifying device. Some specimens that cooled rapidly contain a significant amount of glass, while others that formed from gas-charged lavas have a vesicular or amygdaloidal texture. 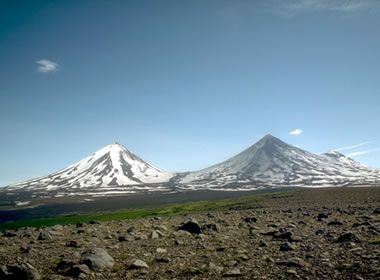 Stratovolcanoes: Pavlof Volcano (right) and Pavlof Sister Volcano (left) are a pair of symmetrical stratovolcanoes built of andesite flows and tephra on the Alaska Peninsula. Pavlof Volcano is one of the most active volcanoes in Alaska. Photo by T. Miller, United States Geological Survey. Andesite and diorite are common rocks of the continental crust above subduction zones. They generally form after an oceanic plate melts during its descent into the subduction zone to produce a source of magma. Diorite is a coarse-grained igneous rock that forms when the magma did not erupt, but instead slowly crystallized within Earth's crust. 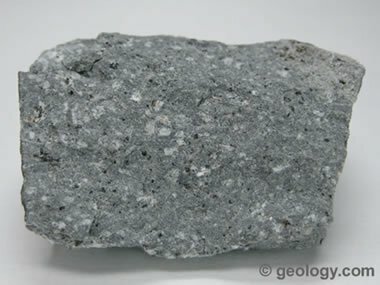 Andesite is a fine-grained rock that formed when the magma erupted onto the surface and crystallized quickly. Andesite and diorite have a composition that is intermediate between basalt and granite. This is because their parent magmas formed from the partial melting of a basaltic oceanic plate. This magma may have received a granitic contribution by melting granitic rocks as it ascended or mixed with granitic magma. Andesite derives its name from the Andes Mountains of South America. In the Andes it occurs as lava flows interbedded with ash and tuff deposits on the steep flanks of stratovolcanoes. Andesite stratovolcanoes are found above subduction zones in Central America, Mexico, Washington, Oregon, the Aleutian Arc, Japan, Indonesia, the Philippines, the Caribbean, and New Zealand, among other locations. 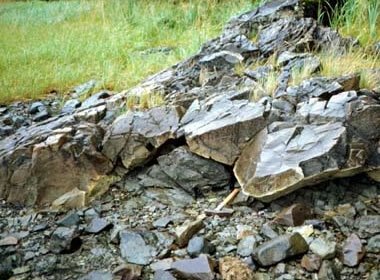 Andesite can also form away from the subduction zone environment. For example, it can form at ocean ridges and oceanic hot spots from partial melting of basaltic rocks. It can also form during eruptions at continental plate interiors where deep-source magma melts continental crust or mixes with continental magmas. There are many other environments where andesite might form. Pavlof Volcano - plate tectonics: Simplified plate tectonics cross-section showing how Pavlof Volcano is located above a subduction zone where basaltic crust of the Pacific Plate is being partially melted at depth. The ascending magma then passes through continental crust, where it might mix with other magmas or be altered by melting rocks of different composition. Occasionally, andesites contain large, visible grains of plagioclase, amphibole, or pyroxene. These large crystals are known as "phenocrysts." They begin forming when a magma, which is cooling at depth, approaches the crystallization temperature of some of its minerals. These high-crystallization-temperature minerals begin forming below the surface and grow to visible sizes before the magma erupts. When the magma erupts onto the Earth's surface, the rest of the melt crystallizes quickly. This produces a rock with two different crystal sizes: large crystals that formed slowly at depth (known as "phenocrysts"), and small crystals that formed quickly at the surface (known as "groundmass"). "Andesite porphyry" is the name used for these rocks with two crystal sizes. Andesite outcrop: Close view of an andesite lava flow at Brokeoff Volcano in California. Photo by the United States Geological Survey. Hornblende Andesite Porphyry: A specimen of andesite with large visible hornblende phenocrysts. This type of rock could be called an "andesite porphyry" because of its texture. It could also be called a "hornblende andesite" because of its composition. Photo by NASA. Water vapor produced when ocean-floor sediments on an oceanic plate are heated in a subduction zone. Water vapor produced when hydrous minerals dehydrate in the heat of a subduction zone. Carbon dioxide produced when rising magma encounters carbonate rocks, such as limestone, marble, or dolomite. Water vapor produced when a rising magma chamber encounters groundwater. At depth, these gases can be dissolved in the magma like carbon dioxide dissolved in a can of cold beer. If that can of beer is shaken and suddenly depressurized by opening the can, the gas and the beer will erupt from the opening. A volcano behaves in a similar manner. A rising magma chamber instantly depressurized by a landslide, faulting, or other event can produce a similar but much larger explosive eruption. Many volcanic plumes and ash eruptions occur when gas-charged andesitic magmas erupt. The gas pressure that causes the eruption blows large amounts of tiny rock and magma particles into the atmosphere. These particles can be blown high into the atmosphere and carried long distances by the wind. They often cause problems for aircraft operating downwind from the volcano. Catastrophic eruptions like Mount St. Helens, Pinatubo, Redoubt, and Novarupta were produced by andesitic magmas with enormous amounts of dissolved gas under high pressure. It is difficult to imagine how a magma can contain enough dissolved gas to produce one of these eruptions. Andesite Flow: One of numerous massive andesite flows from the Zarembo Island area of southeastern Alaska. They are gray pyroxene and feldspar porphyrys that weather to maroon or green. Photo by USGS. The formal definition of andesite is problematic. Many authors have classified igneous rocks based upon their chemical and mineralogical compositions. However, none of these classifications are in perfect agreement. For a fine-grained rock like andesite, these classifications are impossible to use precisely when in the field or the classroom. 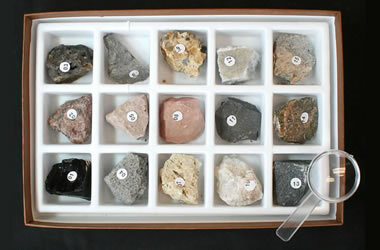 They require chemical or mineralogical analyses that are usually not available, affordable, or practical. 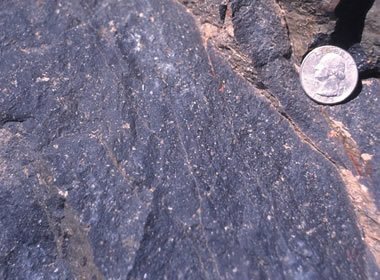 If you examine a rock that appears to be andesite, but you are not confident that it meets the mineralogical or chemical classification of andesite, you can properly call it an "andesitoid" rock. That means that while the rock looks like andesite, a microscopic examination or chemical testing might prove you wrong!